Moving in to your first office can be pretty cool, but for most (self funded) start-ups you tend to spend your formative years either working from home or renting a desk with other companies. There are are a few ways to manage your work environment and I have experience of most of them – below is a break-down of the key options and what I found. There are lots of advantages in doing this – but unfortunately it is coupled with a few striking disadvantages. I worked from home for a little over a year as we started up for the first time. At this point we did have an office but this was in Kuala Lumpur where our programming team was; in the UK there was just me doing my best to keep them busy. I had recently moved to a flat in North London over looking a park with a friend who I used to work with. There are some advantages to having no commute and ‘arriving at work’ basically means sitting up in bed and picking up your lap-top. However it not always conducive to a productive work environment. The key disadvantage is that you find yourself travelling out for all your meetings and you find yourself feeling slightly awkward when you say you work from a home office (it clearly positions you as a small company or one man band). It got to a point where taking on additional employees or interns just felt a little awkward and when dealing with more serious clients the fact that you do not come across like a ‘real’ business does become an issue (even if it is just down to confidence). There are plenty of companies offering hot desking environments and depending to what sort of company you are starting certain types of offices will suit you more. They usually have additional costs for when they take and forward calls for you and other add-ons like meeting rooms and such. I did not really want to move in to this kind of office, many are practically chicken farms, and generally over priced for what you get. The easier option is to find a small business that has some spare desk space that they are looking to rent out to individuals or other small businesses. You can usually find a decent desk in a friendly, small and intimate office for £200 to £350 per month. I moved in with another start-up albeit a more advanced company and built good relationships with was beneficial for everyone involved. I rented one desk, and if I needed more for free lancers or employees, it was easy enough to take another. One key issue with moving offices like this, or running a lean start-up in this way, is sorting out a phone line. The easiest way is probably to just have a land line number that forwards to your mobile. If you are often out in meetings this is invaluable. As you grow you are likely to need a bit more than a couple of desks in an office – somewhere for your business to call ‘home’. 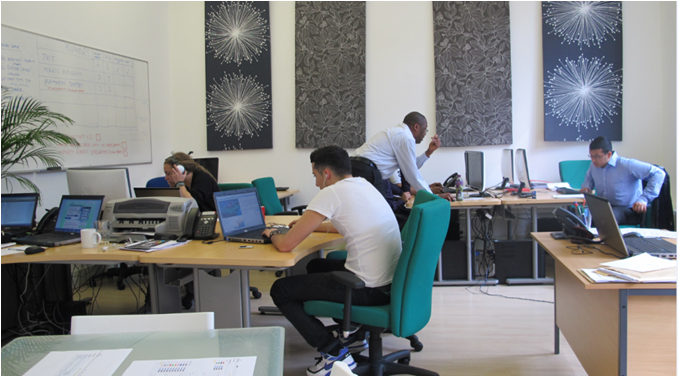 We moved in to serviced offices early into our third year. Our first office was enough for 12 people and a small meeting table (we were not too fussy about putting people close together) and as we got the office in the middle of a recession it really was not a problem to negotiate down rent costs (for which we got about 30% off). The office cost around £3,000 per month (in 2009) (if my memory serves me correctly) and although actually pretty expensive for the space we could leave with more-or-less 3 months notice and phones, IT, internet, chairs, desks, cleaning, heating, electric, reception and post collection was included. It meant we could move in and be up and running in a matter of hours. About a year later we moved into a larger room in the same building – which cost about £5,500 and I estimate to be around 750 sq/ft. The office was actually pretty damn nice, but at £95/sq/ft/year it was obviously fairly expensive. We were able to fit around 20 people in that space, and to be honest could have fit another 10 if we were going to push it! We wanted space for about 30 to 40 people it was obvious that moving into a leased office would make more sense. Also as we were getting bigger it was clear that our revenue streams were going to be a bit stronger and we could ensure that we would be able to honour longer-term rent agreements. A cost consultant suggested that we should be able to find space at £17.50 per square ft per year. When you consider that a serviced office was costing us almost three times that it is something worth considering. I figured out that a space twice as large (if we could deck it out with reasonably cheap furniture) would probably be cheaper to take on a 2 year lease than one year at our current serviced office. Finding a leased office is not quite as simple as a serviced office – as you might expect; this is a basic break-down of what is going to happen. 1. You open pandoras box by filling in a few online enquiry forms for the next few weeks you will be harassed by agents and introducers to try and get you to visit some places. 2. You find out that you will probably have to go through an agent who will most probably expect 10% of the office’s rent as a fee and potentially will want you to pay a % of cost they have negotiated down and on top of that they might expect you to sign an exclusivity agreement. See an example below! It was a pleasure speaking with you recently and thank you for taking the time to explain the reasons for the office move and your thoughts for a new site. —omitted name— would be delighted to be appointed to represent you as your exclusive agent in the search, selection and negotiation of your new office space. As discussed we can offer a variety of services that also include leasehold, freehold, renewal negotiations, dilapidations and other advice to give you a comprehensive over view of the market in general. To be thorough I am this stage giving you a basic cost and analysis on each area that we can be of assistance. Be on hand to provide general advice in respect of the office relocation. Our fee for the above services will be 10% of the annual exclusive rent and 10% of any negotiated savings. Fees are exclusive of VAT. Fees based on a percentage of annual rent will ignore any rent free period or incentives. A fee element calculated on negotiated savings will be based on the value of savings up until the lease expiry or the first tenant break clause (whichever is earlier) and calculated from the quoted terms and will include the value of any rent free period or relevant premiums. Our fees for searching and negotiating on a freehold basis would be 1% of the freehold value. This includes a .5% reduction and no savings fee. To include selecting refurbishment, physical move, cabling and telecoms plus all the initial vetting will be based upon 10% of costs in total or in parts but certainly this will include ensuring you gain the best overall costs. —omitted name— is to be appointed as your sole exclusive adviser/agent as defined in our Terms of Business. Our period of exclusivity will be 16 weeks of which during and after any property introduced by —omitted name— will attract the fee as above. Once we receive a signed copy of our instruction acceptance either by email or in the post we will be able to start working on finding you a new property. In the meantime please contact me to discuss any questions you may have. As you can see – pretty intense and WAY over the top after just a single phone call. My advice would be to try and find someone on recommendation; ideally without giving anyone an exclusivity agreement as they might be useless and will have you in their pocket from then on. Once you find an agent, and you have found an office, signed an agreement and made sure that you have covered every sort of liability, so things do not come and surprise you later, you still need to purchase furniture, and very importantly get BT to get a phone line in – best to give a month or two to allow this to happen as they are notoriously slow. To sum up – you can have a professional sounding and feeling office for as little as £200 pounds a month per desk – making it accessible for most start-ups.